Pediatric Occupational Therapist since 2000. 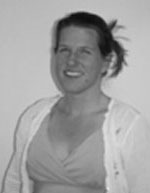 During her childhood in Maine, Rebecca was influenced by her mother, a preschool teacher and special education teacher. She spent 10 years living and studying in New Zealand, returning to live in Montana in 2002. Rebecca lives in downtown Bozeman with her husband and two children. Along with running a business, Rebecca enjoys time with her family, running, rock climbing, skiing, gardening and weaving.